I’ve been riding Rose to Toads annually for many years now; the basic route is approximately 62 miles, 8000 feet of climbing, and 10,000 feet of descending. A world class route, this very challenging ride has it all, high altitude riding, unmatched views, technical rock riding, and flowy trails. Over the years particularly the last couple, many new trails have been built to not only increase the amount of single track along the route, they also provide many options for cutting out early without going all the way to Toads. There are two new TRT trail segments that connect the Bench trail to Kingsbury grade. Another new section of TRT single track provides an option to ride from Kingsbury to Stagecoach. 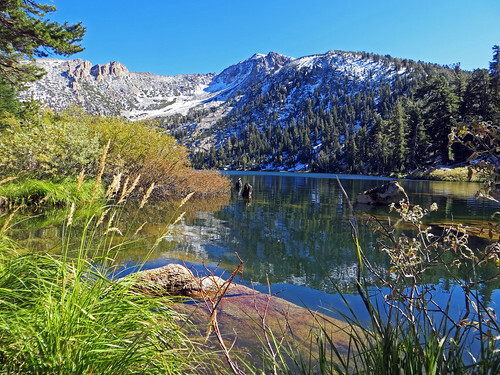 The Star Lake Connector trail to Cold creek, Van Sickle trail, and Armstrong pass all offer fantastic ways to exit early. For those who want to go bigger, bypassing Toads and taking the TRT to Christmas Valley trail is a great extension. 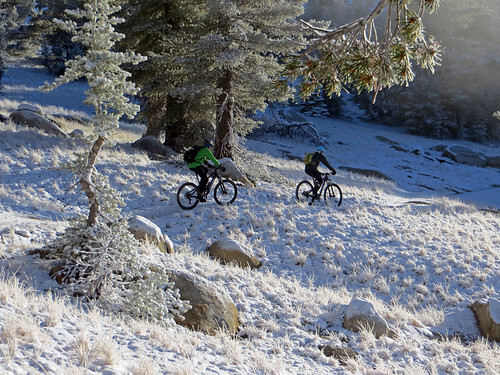 “Magical” riding through the September snow. The options will only be increasing! 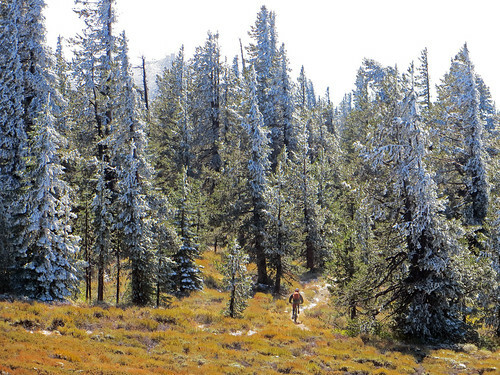 This year we should see the completion of the new Monument pass trail that will connect to Cold creek. TAMBA is working hard on a reroute of the Kingsbury Stinger trail in addition to working on bike access to the Snow Peak segment of the TRT, a stunningly beautiful segment. The Heavenly bike park trails potentially will create another way down into town in the future also. 2013 the year of Fire & Ice the ride seemed to be cursed, the massive fire down in Yosemite blanketed the basin in smoke sending both residents and tourists out of the basin looking for smoke free air to breath caused the ride to be rescheduled from August 31st to Sunday September 22nd. A storm rolled in on the 21st dumping rain in the lower elevations and from looking at the ski resort webcams snow at the upper elevations. 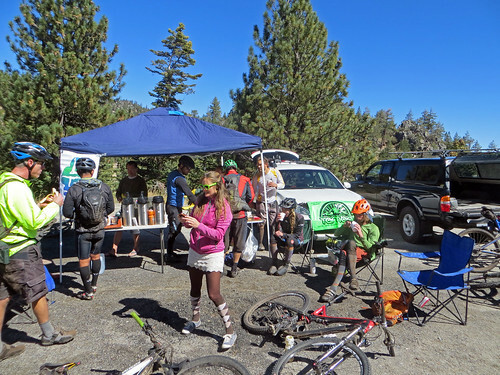 Despite the weather there were very few no shows in the morning and a big sized group of hearty souls hopped on the shuttle buses provided by Max from the Flume Trail Bikes and Joe from Shuttle Around Tahoe. The ride started out very cool, literally! With a shallow white blanket of snow that made riding very surreal and very fun. It was really cool until dropping the Bench to Kingsbury, this is one of my favorite segments of the rim trail, this day it would be for me a total misery zero fun drop, cold, streams running down the trail, snow melting from the trees raining down on top of you. Decomposed granite caked in my drive train, I was never so happy to be done with it. At this point my goal was to just make it to the second rest stopped manned by Jenay and Alison with Lake Tahoe Yoga then bail down VanSickle as I had had enough! Arriving at the rest station on Tramway I was stoked that they had a brush and oil to clean my drivetrain with. Also hot soup and drinks were available to provide fuel to both my depleted body and soul. 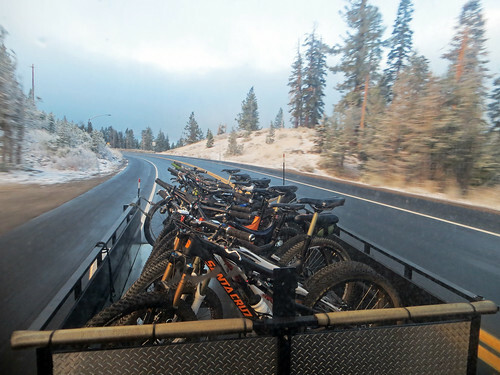 Many folks were bailing down Van Sickle and who could blame them after what they had just ridden though, not to mention getting glimpses of the snow up around Freel. A couple nuts even rode all the way back to Tahoe meadows to avoid going over Freel for even a bigger ride! Hot Cup O Soups to warm the soul with 30 miles to go. The hot soup did its job and I decided to head on towards toads, figuring that most likely I would turn around at some point and bail. The ride became very lonely at this point, from the tracks in the snow between Star Lake and Freel pass it looked like only 3 or 4 riders had continued on in front of me. I got almost all the way to Freel Meadows before catching a fellow from San Diego who had never ridden any of the rim trail before and it was impressive to see him drop Toads like he had done it 100 times. By the time I got to the flowy lower sections of Toads the trail was tacky and perfect and my stoke level was going through the roof, my 3rdAnnual Tamba Rose to Toads was in the books. For myself this ride alone is worth the price of a TAMBA membership and low cost of the shuttle, well worth bypassing the logistics of doing it yourself. So join TAMBA, get in shape and get ready for the ride of your life in 2014!